Following the reunification of East and West Germany, a great deal of effort was put into erasing the physical and visual cues that a border had ever existed, but on one unlikely front in particular there was pushback from the public: Ampelmännchen. 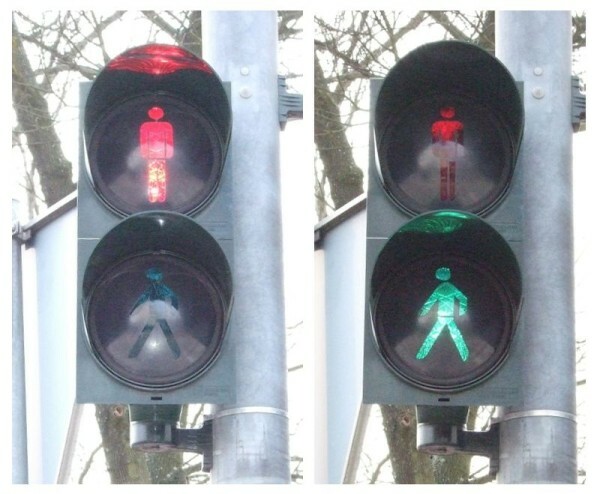 These “little traffic light men,” (all one word in German, naturally) feature a standing and a walking variant to indicate “stop” and “go,” respectively. 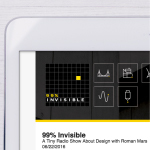 They were designed in 1961 by traffic psychologist Karl Peglau, whose proposal critically called for differentiating by shape as well as color, a helpful addition for those with vision difficulties including color blindness. After numerous iterations, the distinctive straw hat Peglau added to his design along the way made it into the final version. 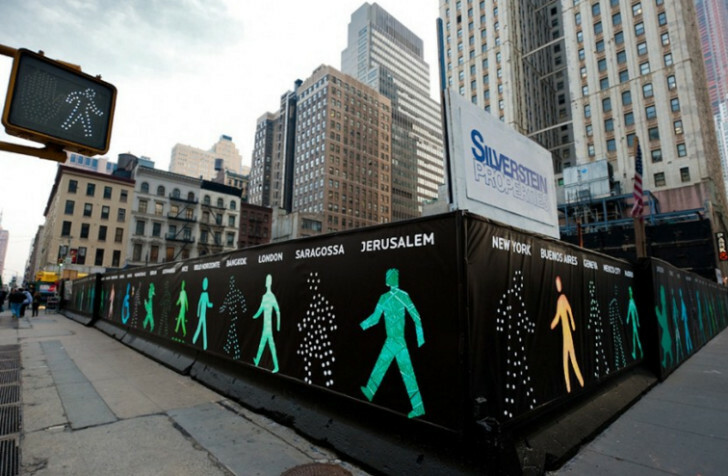 As the figures began appearing on street corners around the country, this small but distinguishing feature helped them become more culturally iconic than their creator could have ever imagined. 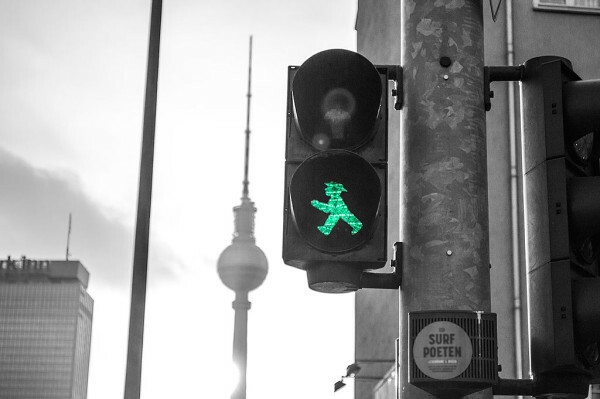 The Ampelmännchen would come to star in their own comic strips and radio shows, taking up prominent roles in public service announcements regarding street-crossing safety. The fame of these figures prior to the fall of the Berlin Wall was well-established thanks in part to these media appearances. Their popularity contributed to public outcries to save the figures in in post-unification Germany when plans were announced to standardize lamp styles both East and West. Today, the Ampelmännchen memorabilia trade (from t-shirts and keychains to posters and re-purposed lamps) is an industry worth millions of Euros per year. 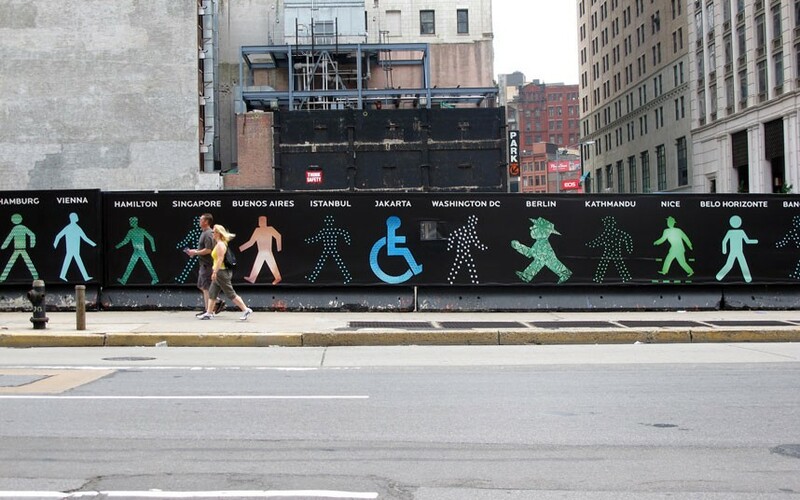 The figure of the “walking man” in particular has become a kind of standing ambassador for Ostalgie (nostalgia for the former German Democratic Republic, or: East Germany). It “enjoys the privileged status of being one of the sole features of communist East Germany to have survived the end of the Iron Curtain with his popularity unscathed,” writes the Deutsche Welle. 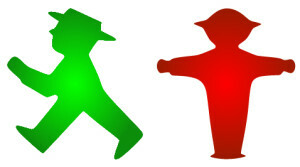 Asked about their uncanny popularity in 1997, Peglau added his point of view: “It is presumably their special, almost indescribable aura of human snugness and warmth, when humans are comfortably touched by this traffic symbol figure and find a piece of honest historical identification, giving the Ampelmännchen the right to represent a positive aspect of a failed social order.” The figures even managed to spark a post-reunification feud between a pair of entrepreneurs, one originally from the West and one from the East, each seeking exclusive rights to its likeness. 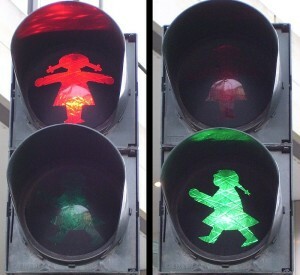 While these former-GDR figures are particularly well-known and much-beloved, they are far from the only unique pedestrian traffic light characters. 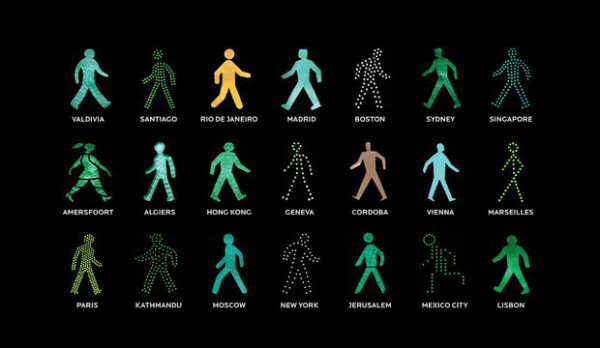 Indeed, such “walking men” (or in some cases: women) can vary dramatically between cities and countries. 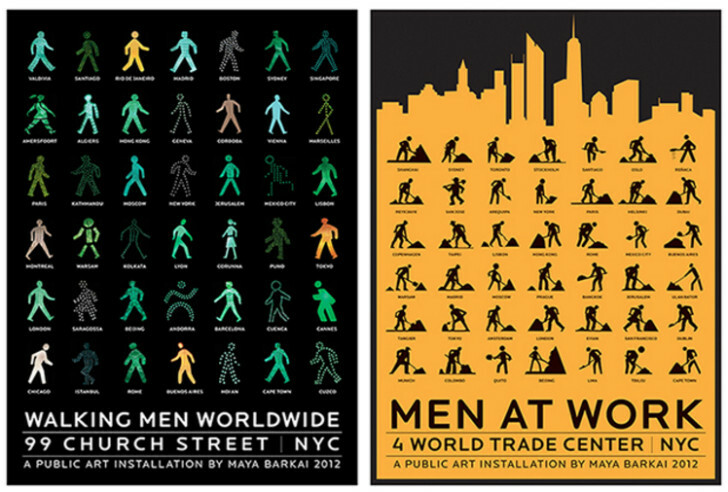 The Walking Men Worldwide project by Maya Barkai has collected images of traffic icons from around the world, presenting them on posters but also as urban installations at human scale. 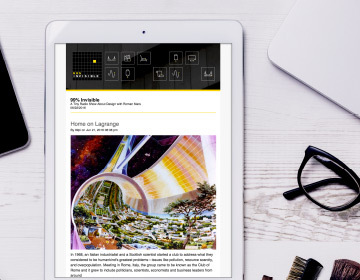 The project draws on the work of photographers from around the world, each capturing a piece of the larger collage and contributing their takes to the mix. 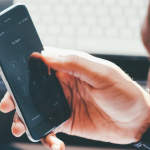 These figures have been presented in countries including the United States, Russia, Australia and Argentina. In some ways, there is surprising commonality across many of the different designs: they are generally green and red, often featured in a pair of dynamic and static poses. Yet the variations visible when these figures are set side by side are also remarkable. 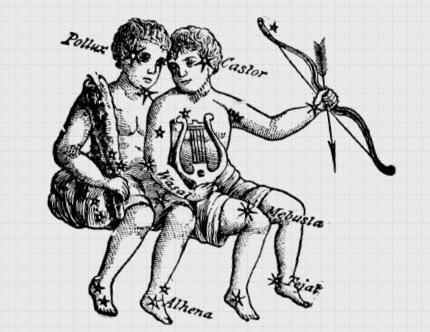 What each person might individually imagine to be a universal figure is suddenly quite unique, associated with a specific culture, place and time. 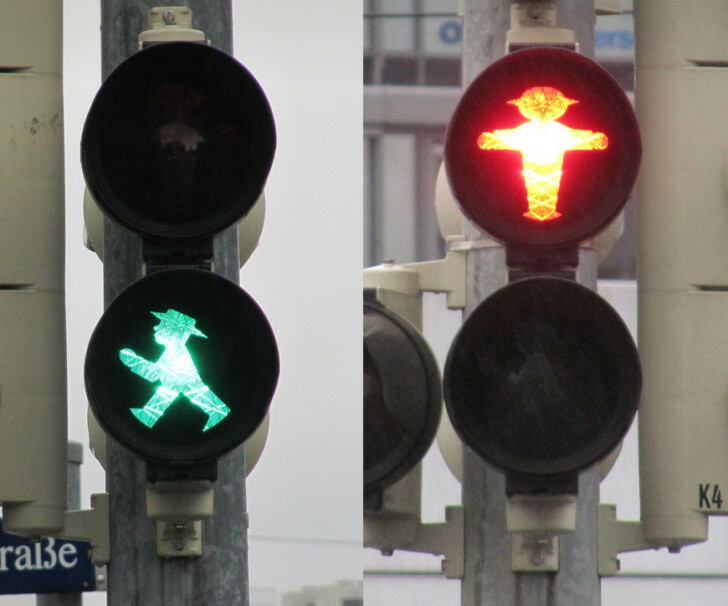 There are a couple of traffic junctions in Berlin with the Ampelmann on one side of the road and the West German man on the other side. Try to find them! Quick note to say that the fields for the forward and back arrows on the side of the page stretch so far into the page that I have twice changed page while trying to click on something in one of the videos. Funny you did look into the dynamic of it: you should look at “state change” of those sign too. For exemple is there a intermediary state between green and red: how is it expressed and how long is it. 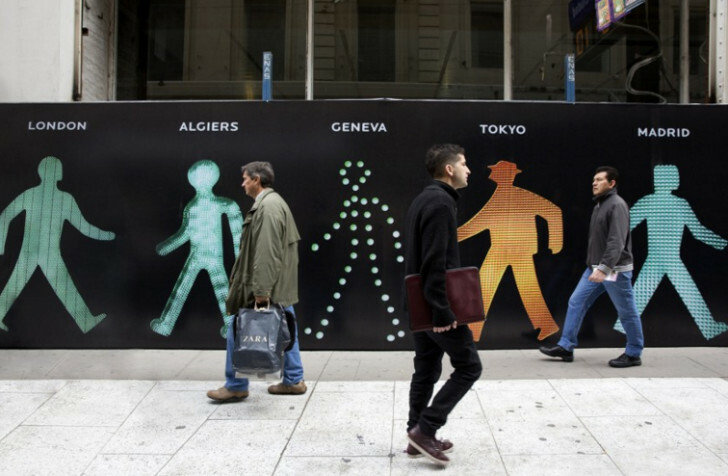 I find it a good sign of the “stress”/”expectations” of pedestrian vs cars in major cities !